The next in our series of make-or-break skills is mastering the jibe. Techniques differ for the symmetrical and asymmetrical spinnakers, but the same three key elements remain. Dave Flynn takes a look at what it takes to master the jibe. After you've perfected your tack, it's time for the next act. We need to master the jibe for both symmetrical (I know there are still some of you out there) and asymmetrical spinnakers. Fortunately, most of the principles are the same. As with tacks, there are three key elements: steering, trim, and weight. As you would expect, the pressure is on the helmsperson. There’s often a lot of focus on the efforts at the front of the boat, but if a jibe goes bad, the fault usually lies further aft. So take heart bow men and women: Good steering can save a jibe with bad mechanics. No amount of mechanical perfection, however, can save a jibe from a poor turn. When steering, the first issue is timing and preparation. If the team isn’t ready, or the spinnaker isn’t full and flying well with the boat at the appropriate angle, the odds are good that things will go wrong. The same “3, 2, 1, turning the boat” countdown will help with coordination. A smooth, consistent rate of turn works best, but don’t turn any faster than the spinnaker is rotated (more on this in a moment). The helms person should use the spinnaker as a visual cue. If the bow gets ahead of the spinnaker as it is eased out, it will collapse and blow back through the foretriangle. If you’re using a symmetrical sail, turn at a rate that keeps the sail flying. For asymmetricals, turn slowly as the sail is eased (until the clew is past the headstay). In light air, you can speed up the turn slightly after the clew has cleared the headstay and is being pulled onto the new side. In medium air, keep the turn slow and smooth – don’t hesitate in the middle (symmetrical jibes may require a very slow rate of turn through dead downwind while the pole is reconnected and pushed out to avoid heading up too fast and making it difficult to push out). Heavy air jibes with either spinnaker type require a committed turn. There can be no hesitation in the middle. You must turn aggressively (but smoothly) at a consistent rate from one jibe to the next. If the pole is not “made” (reattached to the mast) on a symmetrical, or if the sheet has not been fully trimmed and asymmetrical is still luffing, no problem. You can sort that out later – just don’t get caught dead downwind in a heavy-air jibe. As with a tack, finding the right angle to build speed out of a jibe is the trick. In light-to-moderate air, as long as the spinnaker is full, you can head up to an angle a little higher than the angle you went into the jibe. In heavy air, the sail will want to round you up and accentuate the turn – make sure to anticipate that. You may need to snap the helm back to keep the boat from rounding up. Reference the angle to the horizon and waves to judge if the boat is turning, as the wheel or tiller will not tell you a thing. Another parallel to the tack is the release. The key is not getting the new sheet in; it’s all about the ease. The sail must be full and flying regardless of spinnaker type. For symmetricals, it’s usually easiest to have a single trimmer take both sheets, easing one side while trimming the other as the boat turns. On a big boat, this may take two people, but they need to work together. A great drill to hone that skill is to simply put the pole on the deck and jibe 8-10 times without the pole to practice keeping the spinnaker flying. For asymmetricals, ease as the boat bears away, letting the clew float away from the boat until it is at the headstay; release completely, following the sheet to make sure it runs. On the new side, tack the slack out as the old sheet is eased. Once the clew is past the headstay, pull like a mad man. The bow team can help pull the new sheet aft and down. As soon as the sail fills, it will need a big ease (3-4 feet) because you will have over-trimmed to fill the sail. 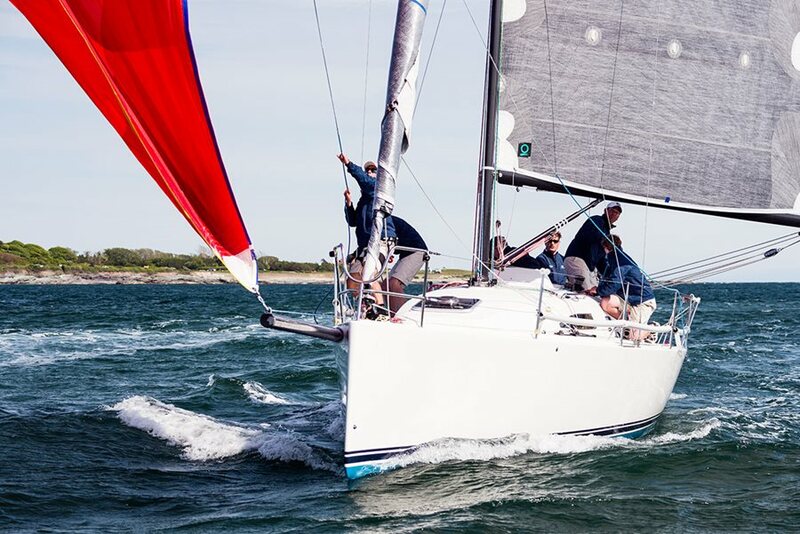 For symmetrical jibes, wait until the sail unloads as you passed dead downwind; grab all the sheet parts (on a smaller boat) and throw the sail across. On a big boat, you’ll need some fast hands pulling in the slack on a winch at the critical unloading moment. You want to avoid trimming in the mainsail as you bear away – that will steer the boat the opposite direction and make the helms person’s job more difficult. No matter what, as soon as the mainsail is across, make sure it’s eased all the way. For asymmetrical jibes, treat the mainsail the same way, but with one modification. In light-to-moderate conditions, you can delay the boom crossing the boat – hold it on the wrong side until the spinnaker fills on the new side, then release. This is called a late main jib. It allows the spinnaker to fill quickly and easily because there is no blanketing effect of the mainsail. For a moment you will essentially be ‘wing and wing.’ Don’t try this in heavy air, though. Just complete the turn, get both sails across, and sort it out later. In light air, hold the weight forward and leeward, and move smoothly to the new side to create heel out of the jibe. The only crew who might have to move are the trimmers. Remember, movement kills speed, so keep it light, then freeze. In medium air, roll the boat a bit. Hike hard on the weather side to flatten the boat and help with the turn. As the mainsail comes across, hold until the boat starts to heel, then head up to the new weather side, “squashing” the boat flat to help it accelerate. In heavy air, get to the high side as the mainsail crosses the boat and hike! Once again, there are a lot of moving pieces if you want to master the jibe, but there are boat lengths to be gained. Good techniques are a lot more reliable than hooking onto the inside of a perfect 15-degree header, and good techniques can be learned and developed, which is nice. with the reacher, medium and code zero we follow all these rules but with the big deep reacher as the driver I add a small pause and call/yell dead down with a slight pause for the foredeck to pull the clew down and around the headstay which keeps it depowered for the gybe.